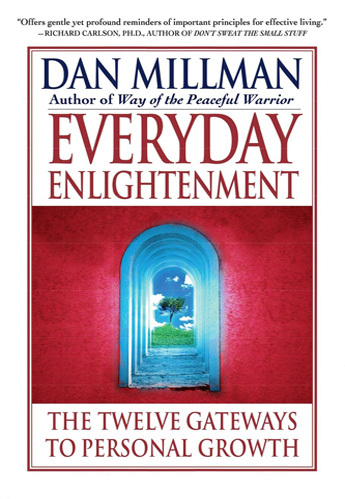 Here is Dan Millman’s magnum opus — the most complete presentation of his teachings, showing how to live as a peaceful warrior — how to actually practice a more enlightened way of life. Everyday Enlightenment presents twelve “gateways” or arenas that radically redefine the meaning of success and the purpose of our lives. These twelve gateways: keys to worth, will, energy, money, mind, intuition, emotions, fear, shadow, sexuality, heart, and service, represent twelve books in one, a clear map of the territory of human potential. Those who have read most or all of my books know that each has a different purpose, and expresses another piece of the puzzle of personal and spiritual growth. Like the story about the five blind men who came upon an elephant and perceived a different kind of creature depending on whether they touched the elephant’s ear, tail, trunk, or leg — someone who reads The Life You Were Born to Live may see me as a “numerologist.” Someone who reads Divine Interventions or Body Mind Mastery or The Laws of Spirit will have a completely different experience. Everyday Enlightenment provides, in a single volume, the most complete map to the major practical and spiritual challenges (and solutions) we face in everyday life. It culminates with a final chapter worth far more than the price of the book: “The Practice of Enlightenment” — a radical approach to living wisely and well.